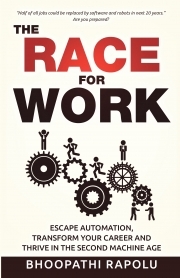 Description of "The Race for Work"
Discover the secrets for thriving in a world being swept by automation! The rapid growth of technology and automation has changed the way we seek our work and find fulfillment—money, meaning and freedom. Those who don’t adapt are being trapped in the downward spiral of career stagnation, working harder and earning less, or losing their jobs altogether. People who understood how to win over intelligent machines have found their dream jobs and career fulfillment. —	Why your job is more at risk than you think. —	Why being productive at your workplace does not help you succeed, and what you can do about it. —	Why today’s capitalistic industry structure is going to get rid of most of the traditional jobs. —	How to win the race against the intelligent machines that are taking our jobs. —	How the Big 3 Technologies are opening up millions of dream jobs. —	Why you are not an outsider to this party and how you can find your dream job in these emerging technologies, irrespective of your current job and experience. —	The proven step-by-step method through which you can find your career fulfillment—more money, more meaning, and more freedom. Technology professionals in their 20s & 30s: Are you wondering why you are not able to grow your career as much as you thought you could? In Chapter 1, you’ll understand the on-the-ground realities about how automation is taking away your growth prospects. In chapter 9, you’ll learn how to win the race against intelligent machines. In Chapter 13, you’ll lean the proven system to find your dream job in a fast- growing technology company that can take your career to new heights. Professionals in business support functions (HR, Sales & Marketing, Procurement, Finance etc. ): Do you feel like you are stuck in a company that is not growing enough and you don’t know how to get into a fast-growing company? In chapter 8, you’ll learn how to find your dream job in any fast-growing technology company or any traditional company that exploits the Big 3 Technologies. Students: Are you considering getting another degree, as opposed to finding your dream job? Before you invest hundreds of thousands of dollars, read Chapter 12 to understand why credentials are becoming less valuable, even as degrees get more expensive. Read Chapter 13 to find your next job that transforms your career. Entrepreneurs: are you wondering if you made the right choice in developing your business idea? In chapters 2, 3, 6 and 7, you’ll find out whether your current business idea is worth pursuing or not. And if not, what course corrections you can make right now to grow your business exploiting the Big 3 Technologies. The tide has turned and emerging technologies are changing the face of business on a global scale. Will you ride the wave of change or be buried under it? Bhoopathi Rapolu is an international speaker, author, and blogger. He has spent last five years meeting hundreds of business leaders in multiple industries around the world, helping them to use the emerging disruptive technologies for automation and for their business growth. Regardless of the industry, country, technology, individual’s role, age, or gender, one simple fact stood out: Automation is eliminating jobs like never before, but also opening up some rare career opportunities, again like never before. Based on his own personal success story in finding his dream job, and hundreds of interactions and dozens of recent books and studies, Bhoopathi wrote The Race for Work to provide others with a real-world guide to escape automation, transform their careers, and thrive in the second machine age. Bhoopathi has published articles on leading international media such as The Huffington Post, The Guardian, Financial Times, The Times UK, and over 20 other leading platforms across the world. Visit www.bhoopathi.com for more details and additional resources. Computer Fundamentals Success Master Edition- - 2000+ Important MCQ E-Book by Harry Chaudhary. Reviews of "The Race for Work"
Automation and people losing their jobs is one of the most discussed threats to working population today. There is fear and lack of clarity on the job market in most of us. I found the most comprehensive discussion on this topic along with some clear guidelines to working professionals in this book. The Race for Work presents a compelling argument on how the traditional jobs are increasingly getting irrelevant in today’s economy. Not just failing a generation of Millennials who can't get professional jobs after 4 years and unmanageable college debt, but the entire working population. Bhoopathi presents the historical contexts of work throughout history, showing how these paradigms each shifting as a result of key technological changes from basic language, Nation-state, Bank, Corporation to the current world of Technology convergence. During the same time, the dominant resource that people value the most has been shifting historically from mother Nature, Land, Capital, Intellectual Capital to finally today the Artificial Intelligence. After laying the groundwork for this theory, Bhoopathi then presents actionable steps to hedge these risks and find promising career opportunities in some of the emerging disruptive technologies what he calls the Big 3 Technologies. He also presents specific strategies and tactics to address some of the age old challenges such as identifying ones dream job, building expertise that other value in emerging technologies etc. With the rate at which digital innovation moves, it's difficult to keep these tactics timeless. But the concepts of the "Entrepreneurial mind-set" and “DREAM methodology” to find ones dream job will hold any working professional in good stead for years to come. To be clear, this is not just a tactics-based "how to find my dream job" handbook for newbies. Nor is it insiders-only philosophical read for successful professionals. It's the necessary balance of age-old philosophical theories, real-world examples of successful professionals, and nitty-gritty strategies and tactics that can create a catalyst for change: not only the WHY, but the HOW and WHEN (i.e. right now)!